+1x FREE SPOT GIVEAWAY to be random'd between all 29 spots in this Break. 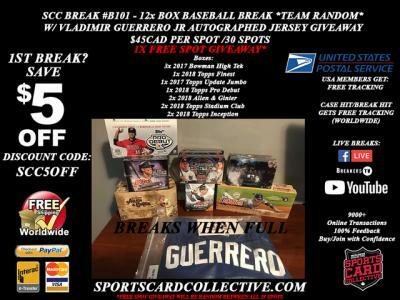 BUY YOUR SPOTS ON OUR SITE: https://sportscardcollective.com/products/12x-box-baseball-mixer-break-b101-team-random? Break is Scheduled to BREAK when FULL! all spots have to be taken/paid for. Please Read our FAQ and Terms of Service.. By Buying a Spot in our Break(s) you Agree/confirm that you have Read Both. With over 9000 Online Transactions and 100% Feedback buy your Spots with Confidence..
Last edited by SportsCardCollective; 12-13-2018 at 01:27 PM. bump 2 more spots sold..
alright crew.. looking to Break Friday night.. lets fill this up and I'll ship Monday. We are busting tomorrow night! Grab up your Spots!